The foreword to the 1980 book Solar Energy for Tomorrow's World proclaims, "A New York Times poll taken in 1979 revealed that 42 percent of the American people optimistically believed that our energy problems could be solved by solar energy in just five years. Most scientists think that's too optimistic. But whether it takes five years - or ten or twenty - they are certain that we will eventually realize what once seemed like only a remote dream." 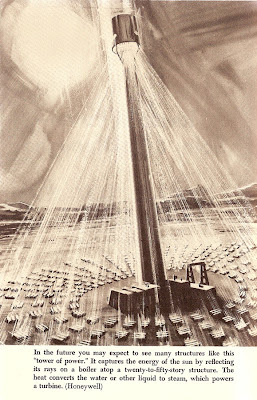 The illustration below, from the first chapter of the book, depicts a future of harnessing the power of the sun as a solution to the energy crisis. The 50-story-high tank of boiling water, powered by mirrors, sounds charmingly Da Vincian. And also incredibly perilous. This blog was wonderful for a few posts, but now it makes me want to kill myself. Does anybody have any information about how to enter this world of the future today? Are there no people with money that have aggregated and created something like this? Is the San Francisco bay area the closest we can come to this? Are NASA/Ames and Caltech/JPL the closest workplaces in this world to this shining vision of the future? 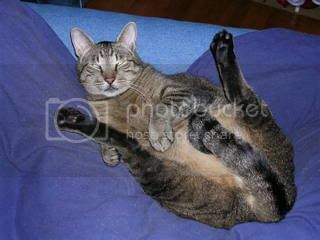 Is everybody who reads this blog a loser? Are the only people who pine for the paleo-future losers? Wow - the prediction was spot on! Yeah, Rocketdyne was building one, and started a second one while owned by Boeing. They called it Solar Two, and the next one is Solar Tres, and is being built for Spain.